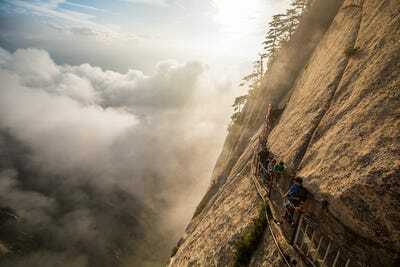 Sunrise OdysseyWhen it comes to the ‘world’s most dangerous hike,’ plan for the worst. 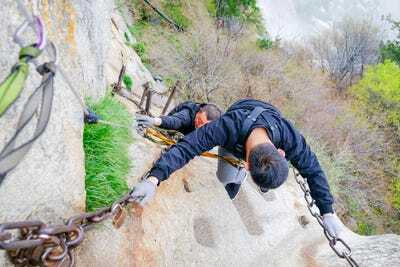 The Plank Walk on China’s Mount Hua is considered by many to be one of the most dangerous hikes in the world. Hikers walk across a few planks of wood bolted into the side of a 7,000-foot peak to reach a small shrine. 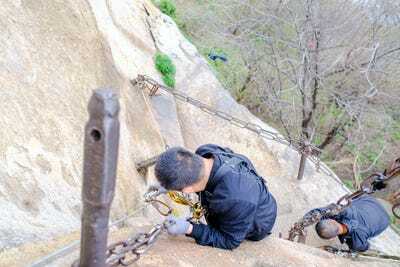 While hikers are harnessed, it is a terrifying adventure. I recently tried to do the Plank Walk on a visit to Mount Hua, but encountered obstacle after obstacle that prevented me from completing it. 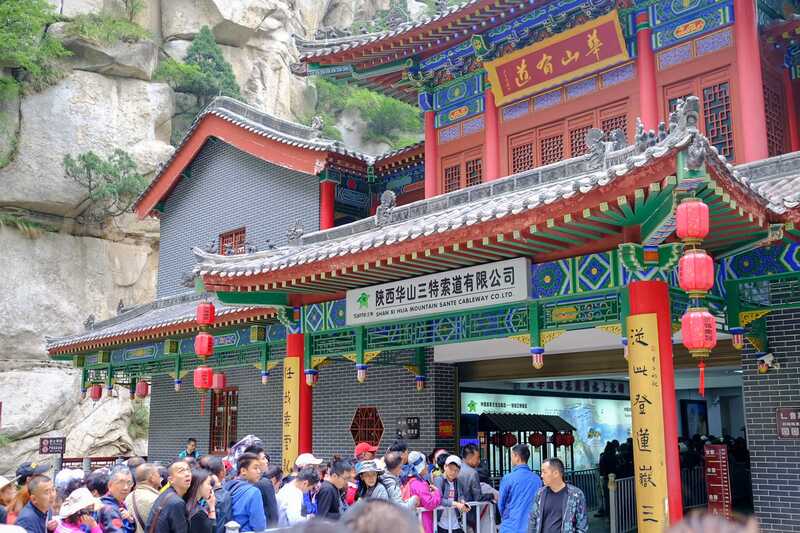 While hiking Mount Hua was an incredible adventure, I was never able to make to the Plank Walk due to massive crowds and bad timing. 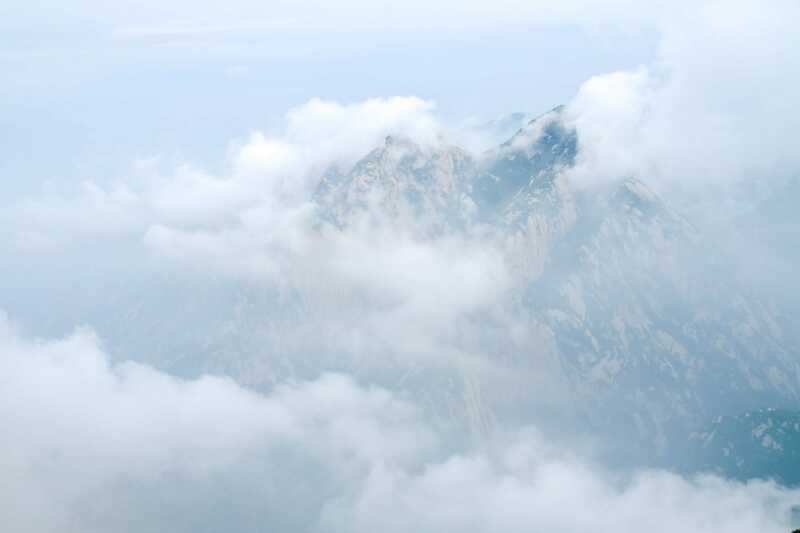 You’ve probably seen the photos of tourists hanging off the side of a stunning mountain. 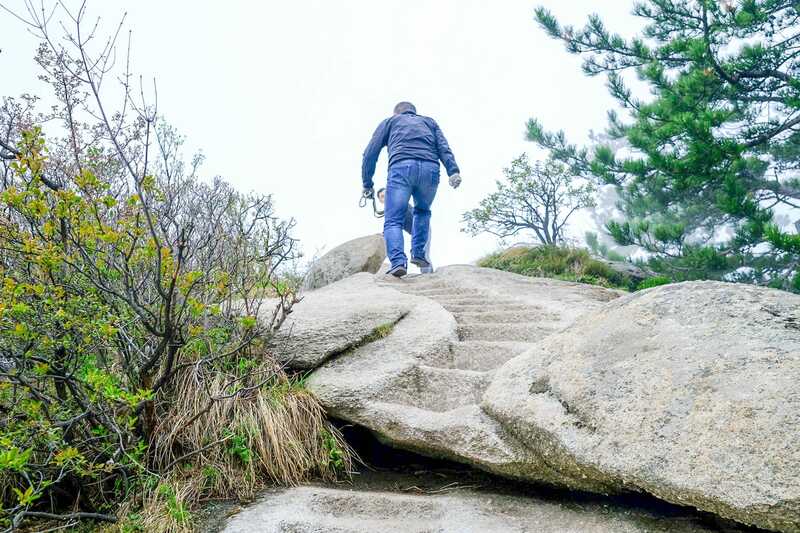 Or else, walking across a few thin planks bolted into a mountainside, their faces buzzing with adrenaline. 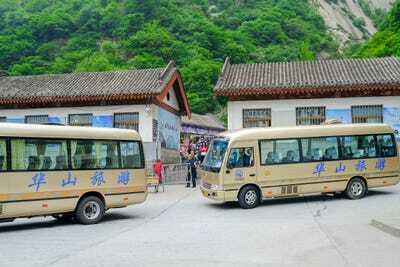 When I found out that the site of those photos is in China, I decided that I had to visit on an upcoming trip to the country. 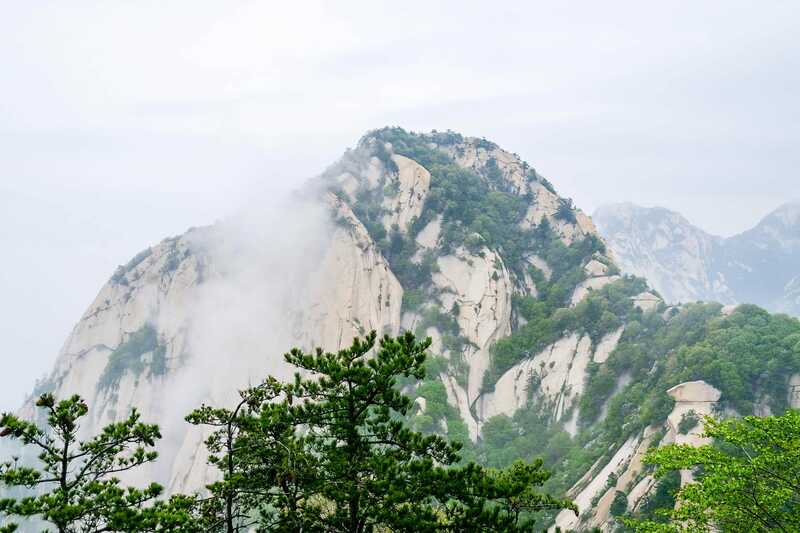 Located about an hour from Xi’an, one of China’s most popular cities for tourists, Mount Hua or Huashan (shan means mountain in Mandarin) is considered to be one of the world’s most dangerous places to hike. 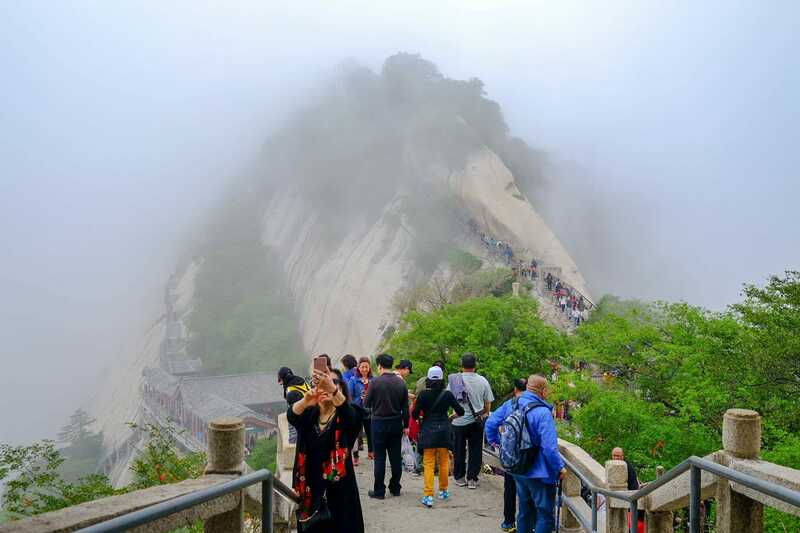 The mountain is considered to be one of China’s five sacred mountains and is one of the most popular tourist attractions and pilgrimage sites for Chinese people. 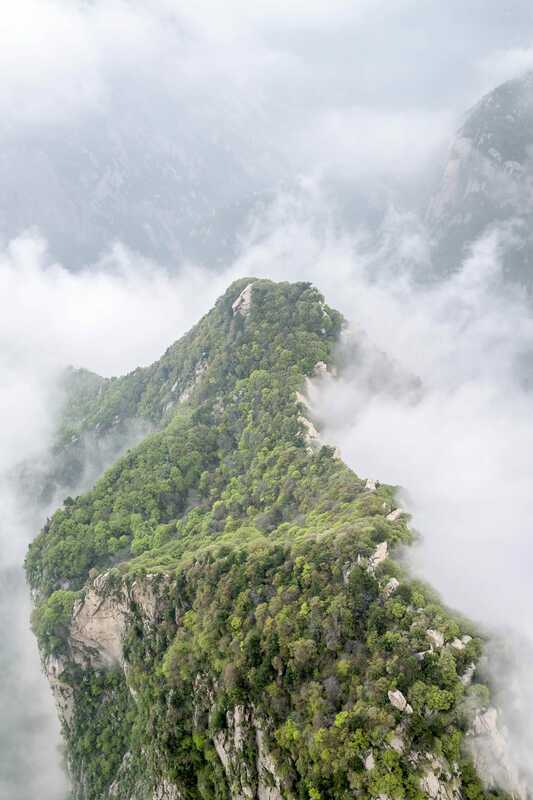 The mountain actually has five main peaks – a North, South, East, West, and Center. 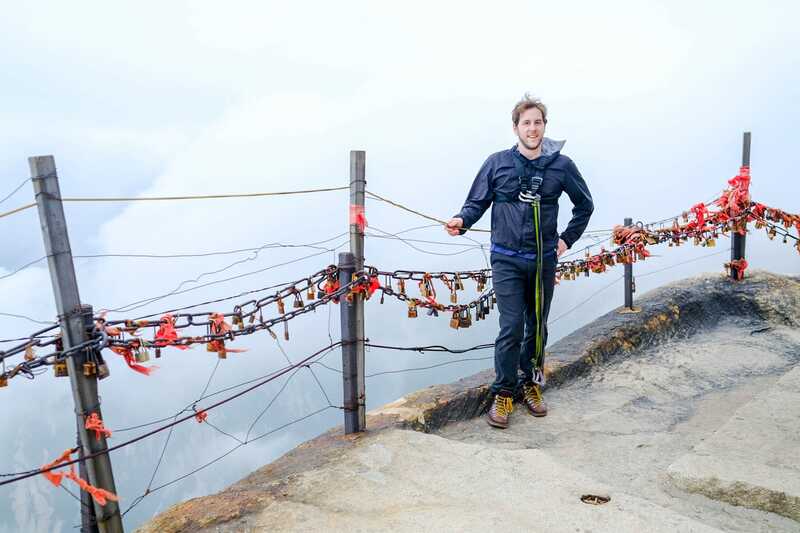 The infamous plank walk is located on the mountain’s highest peak, South, which has a height of 7,070 feet. But nothing went quite as planned on my trip. 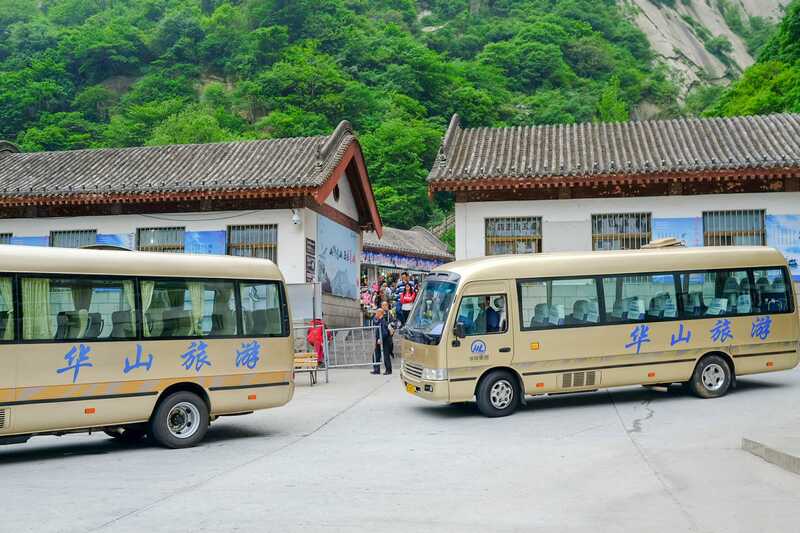 To get to Mount Hua from Xi’an, you have to take a 40-minute bullet train to a 30-minute minibus that takes you to the base of the mountain. But due to a quirk in China’s train ticketing (they stop selling 30 minutes before the train departs), I couldn’t get on the 8:30 a.m. train. 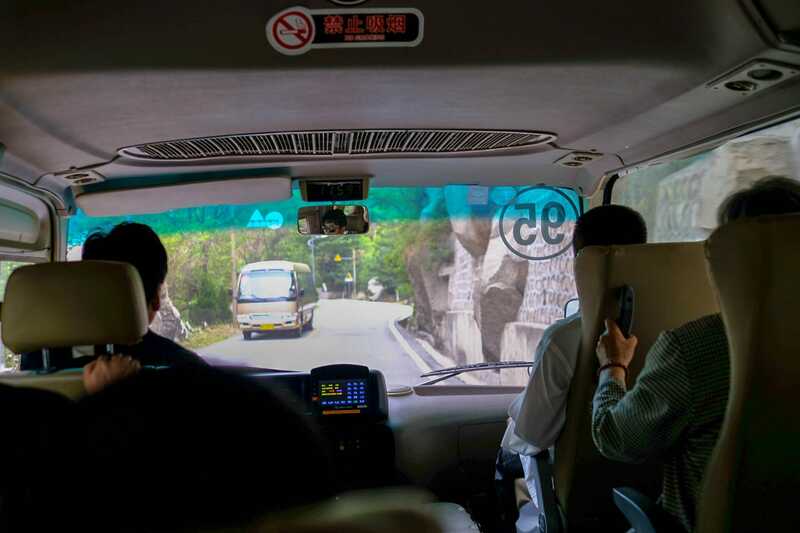 While a train runs every 30 minutes for most of the day, for some reason, there were no trains until 10 a.m after the 8:30 a.m. That meant that I didn’t even get to the base of the mountain until a bit after 11 a.m. Some people start hiking the mountain before sunrise to see everything. 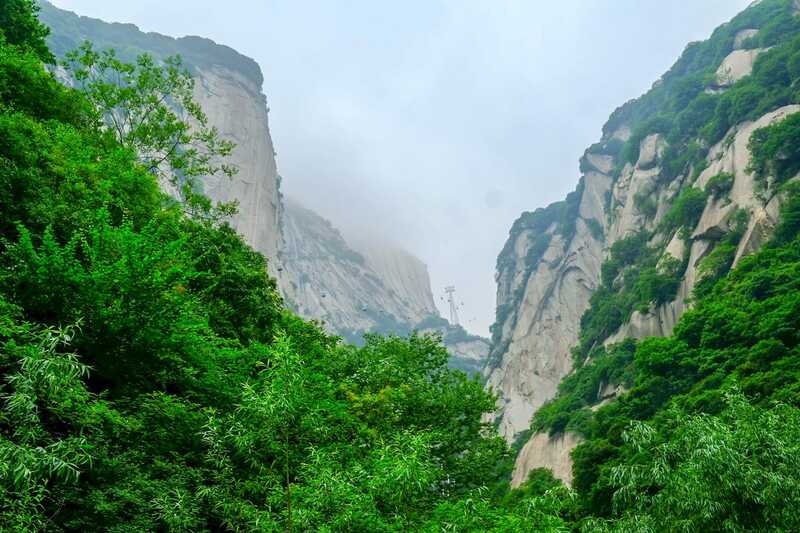 The view from the bottom of Mount Hua is lush. It looks less like a single mountain than a series of granite peaks cut into a valley laden with greenery. Knowing that hiking Mount Hua’s five peaks can take between 5-7 hours depending on your fitness level, our only chance to make it to the “plank walk” was to take the cable car. 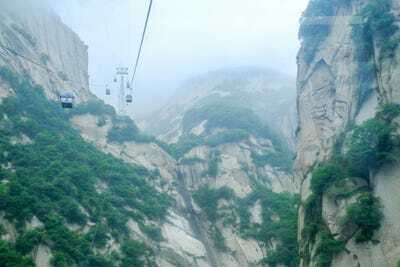 There are two cable cars to the top of Mount Hua — one to North Peak, one to West Peak. I had heard that the North Peak cable car generally has a two-hour line, while West is practically empty (because most people use it to descend). But my plan to game the system was thwarted. 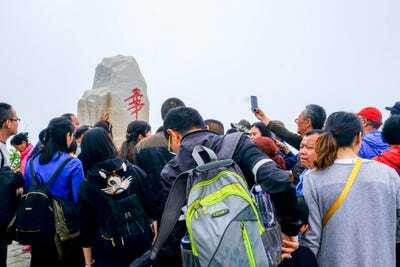 The West Peak cable car was closed due to wind. And that made the line for the North Peak even worse. After about an hour and a half, I reached this pagoda a quarter mile down the road, where I assumed I’d find the cable car. Then I was told that this is only where I pay for the cable car ticket. 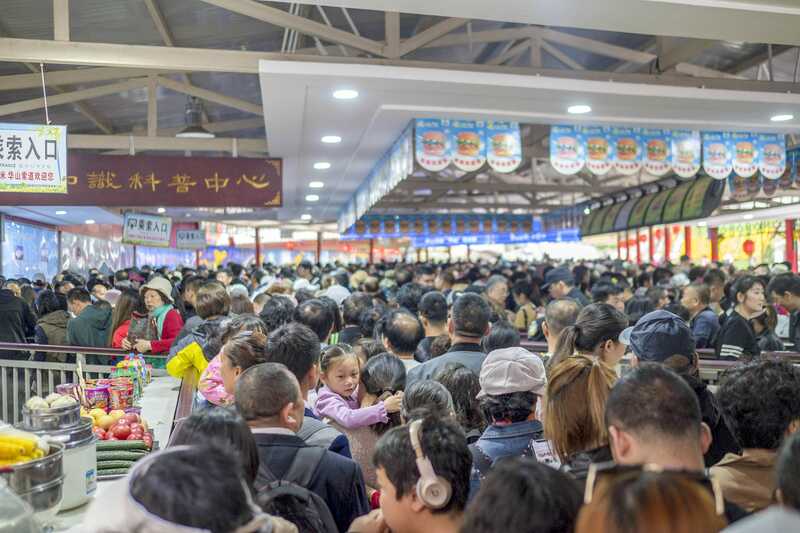 They only accepted cash, WeChat Pay, or AliPay. No credit cards. 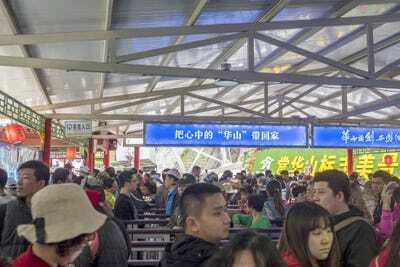 I was almost going to have to head back to Xi’an, but a nice Chinese woman offered to use her AliPay to pay for my ticket — 150 RMB or about $US22 for a round trip. Once I got through the pagoda — another 30 minutes — the line opened up into this nightmare. There were food vendors on either side selling snacks. I realised that I had made a horrible mistake trying to take the cable car. I was going to spend the entire day in line. Another hour later and I was only this far. 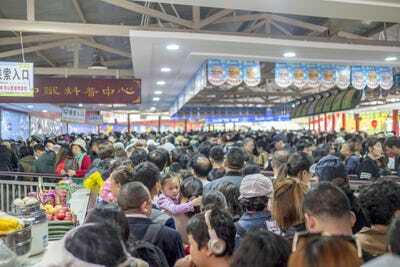 There were piles of instant noodle cups and empty plastic bottles at the end of each aisle. Everyone was seemingly killing time by snacking. Ah, yes. 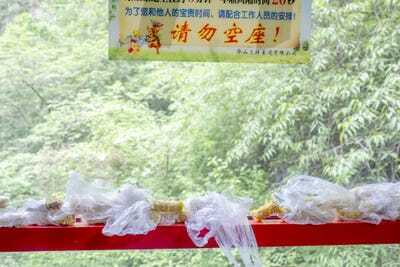 Fully noshed corn cobs. This was just before I made it onto the cable car. 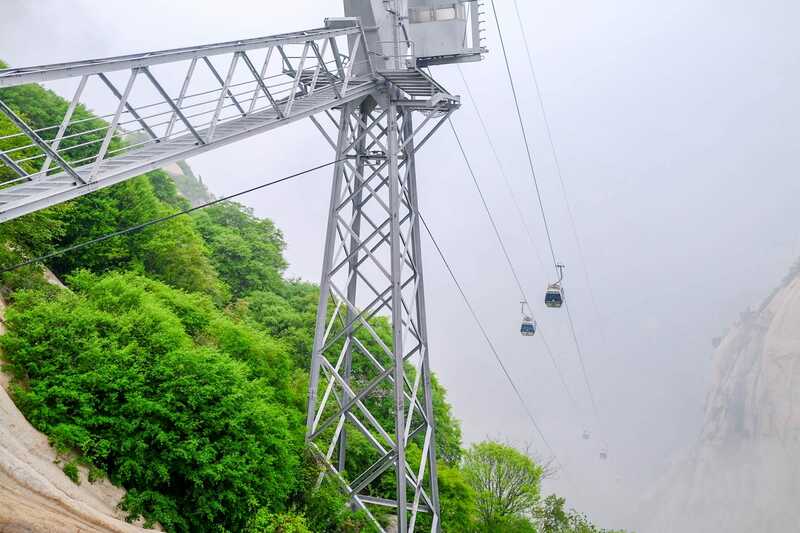 It was 3 p.m. For those keeping count, that was 3.5 hours on the cable car line. Finally, I got on the cable car. This was possibly the best feeling ever. A sense of release and relief like no other. 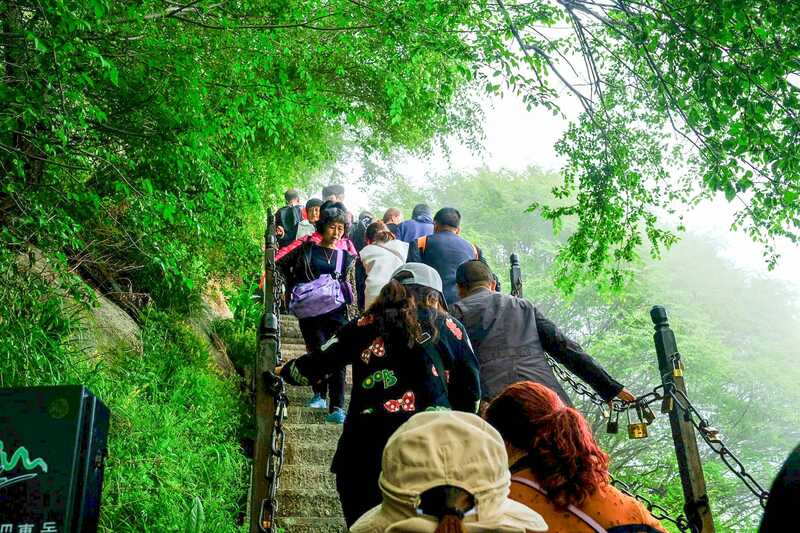 Forget the “world’s most dangerous hike.” This was a thrill. 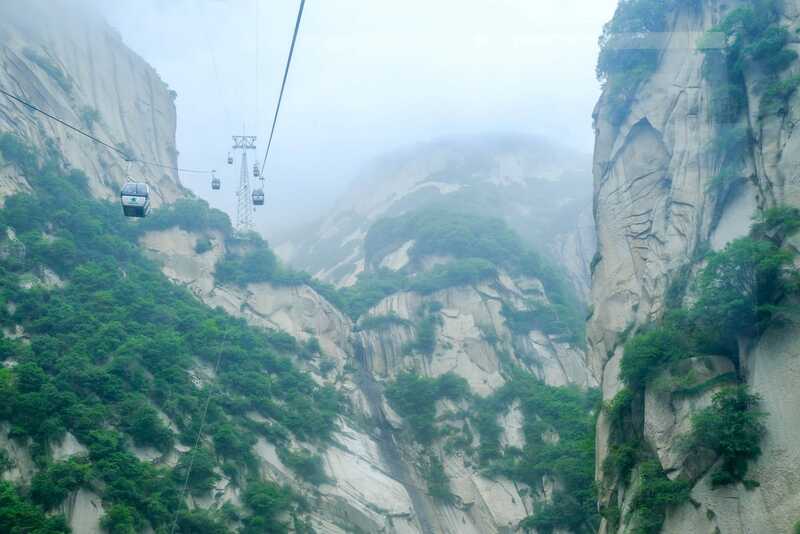 The cable car ride up was only about 15 minutes long. It was a very cloudy day so all the mountains were shrouded in mist. The ride through the granite valley felt otherworldly. Like I was in some kind of fantasy. Along the way, I kept seeing the path that many hikers take to the top of North Peak. 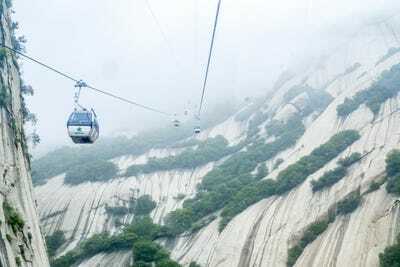 I had originally taken the cable car so I could spend more time seeing the peaks and less time hiking up a single mountain. But many hikers can do the main hike up in four hours, and there is a steeper hike called “Soldier’s Way” that takes two hours. I may have calculated wrong. 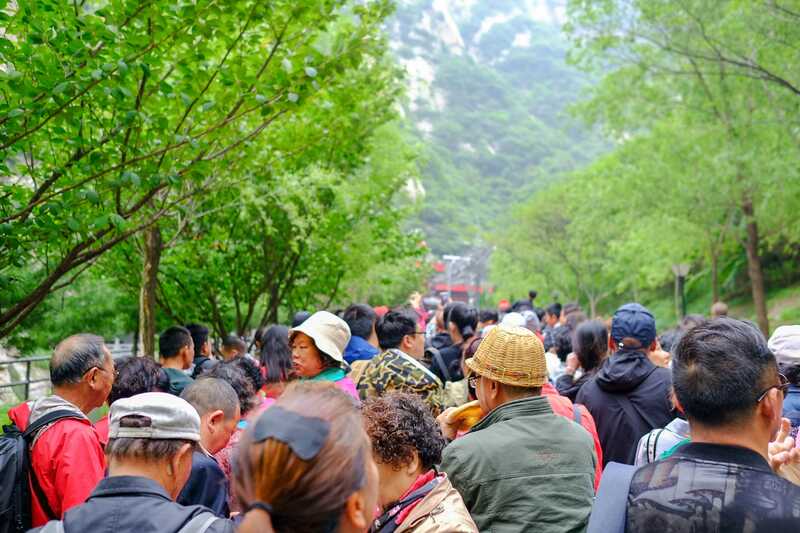 By the time I got off the cable car, I was done with crowds. But, unfortunately, they weren’t done with me. Most of the paths on the mountain near the cable car looked like this. It wasn’t exactly my idea of communing with nature. I soon realised the path was busy because everyone was hiking to North Peak, a short hike and the closest peak to the cable car. 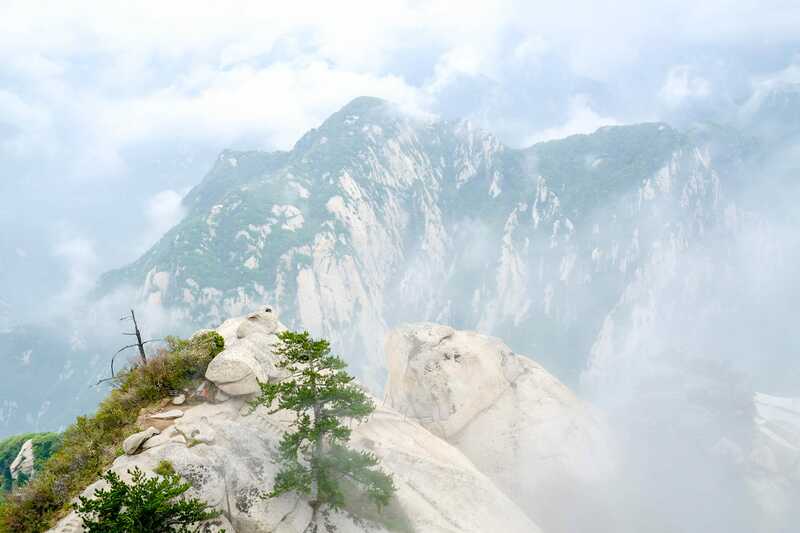 At 5,295 feet high, it is the lowest of the peaks. The top of North is called Cloud Terrace because it is flat, with cliffs on each side. 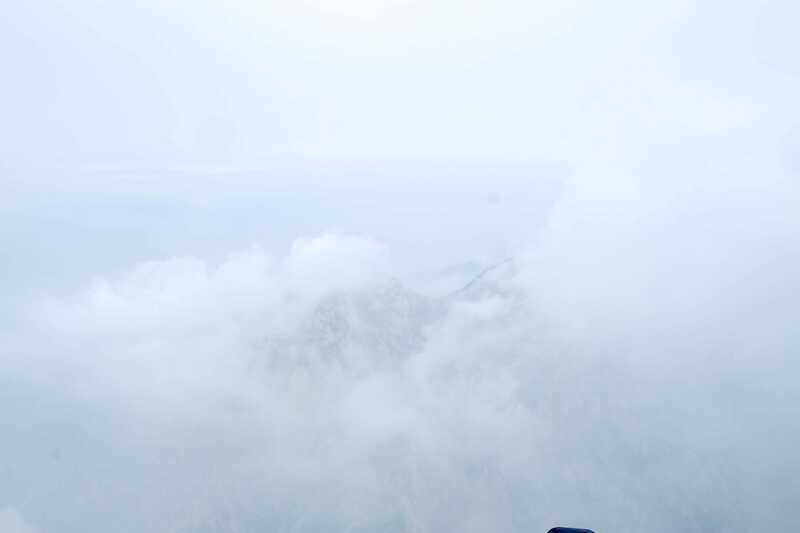 I couldn’t see much with the cloudy weather, but maybe that was the point. The enveloping whiteness mixed with the quietude made one feel like you were in heaven. A very, very crowded heaven. The view as you are walking is vertigo-inducing. 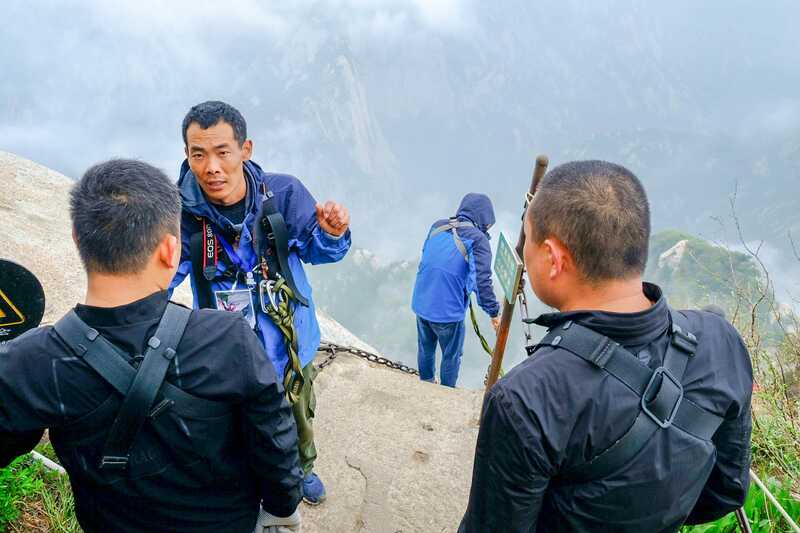 While the “plank walk” is often described as “the most dangerous hike,” all of Mount Hua is dangerous. 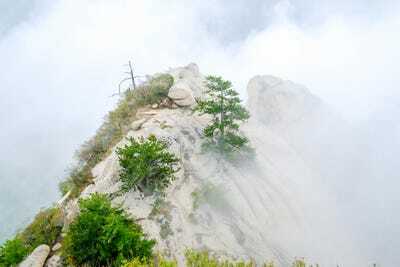 The trail is very thin and, on either side, there are sheer drops. People with a fear of heights will not do well. 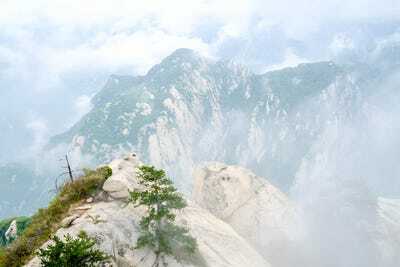 From North Peak, I could see the way to the other four peaks of Mount Hua. You more or less follow one hiking trail to get to all of the peaks, so the farther you go, the less people there are. There are “sky ladders” cut into the side of the mountain that you can use as a shortcut. While the path is directly underneath this, if you slip, you could fall a long way. The elevation is so high and the path so steep that the hike is incredibly tiring. 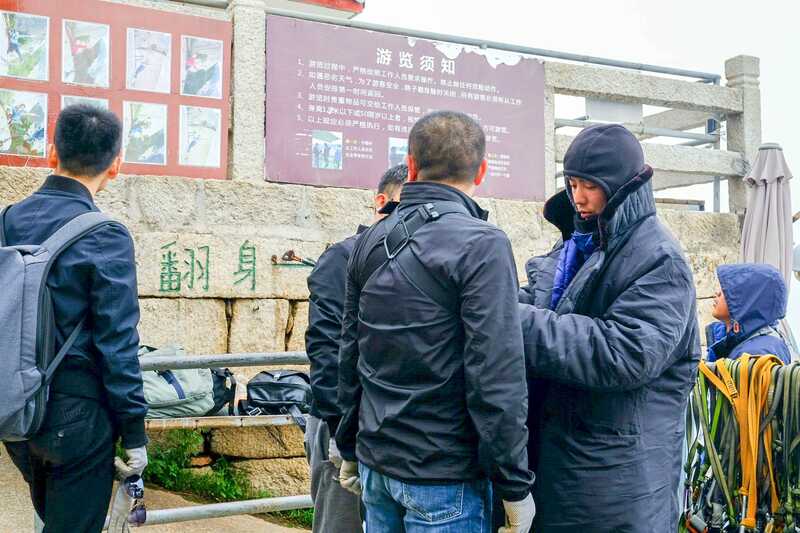 The map says that the trail from North Peak to Central Peak (the first peak before visiting others) takes one hour. It took me a bit longer than that. There were a lot of rests involved for my burning thighs. 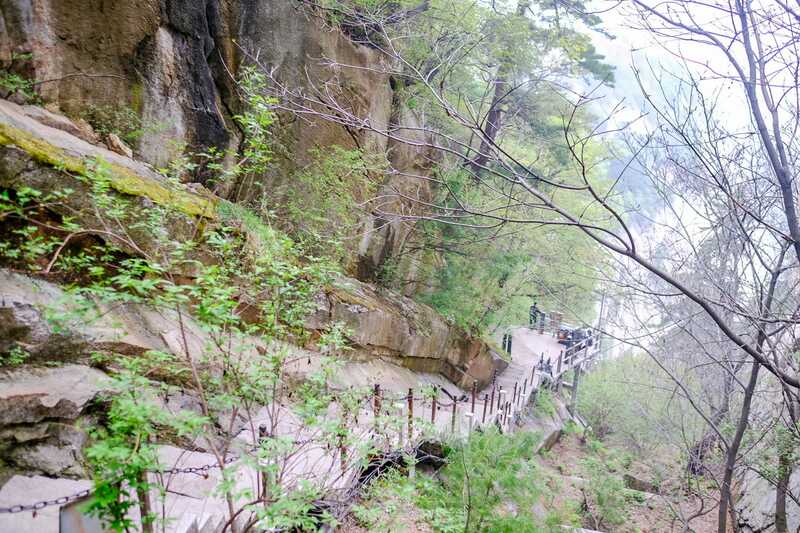 Of course, I saw elderly Chinese people chugging up the mountain paths like it was nothing. From Central Peak, I headed towards East Peak, the fastest way to the Plank Walk. The map said it would take 40 minutes to hit East Peak and then another hour to get to the Plank Walk. It was closing in on 5 p.m.. 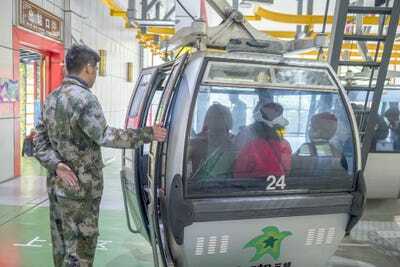 I was told that the cable car to the base closes at 7 p.m. I was racing the clock (and the crowd). As I continued to ascend to East Peak, everything was covered in bright white cloud cover. 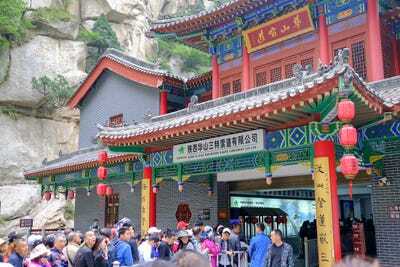 It’s not a stretch to understand why Chinese consider this mountain a sacred place. It feels holy. Near East Peak, I hit the second of the “sky ladders.” This one was far taller and steeper than the first “sky ladder.” With my heavy pack on, I was convinced I was going to fall off. When I hit the last third, I had very sweaty palms. 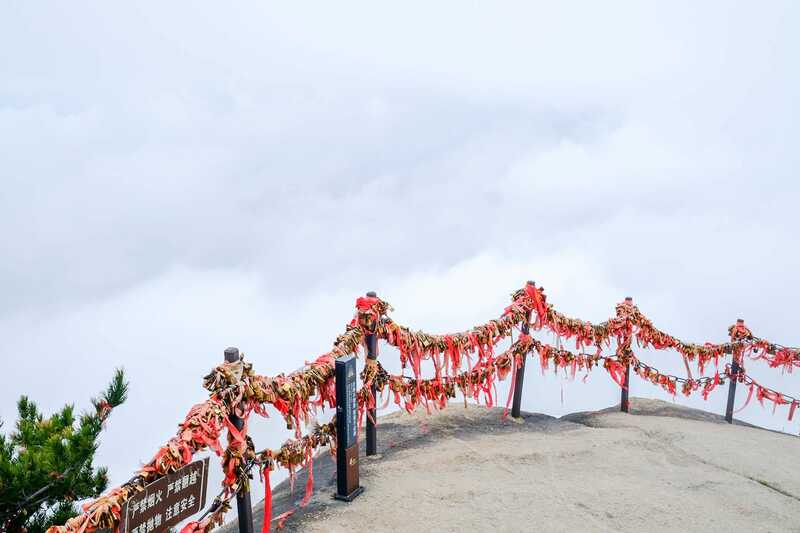 Along the top near East Peak are fences festooned with golden locks and red ribbons. It is customary for visitors to buy the locks at the mountain and lock them on the iron chains to pray for the health and safety of their friends and family. 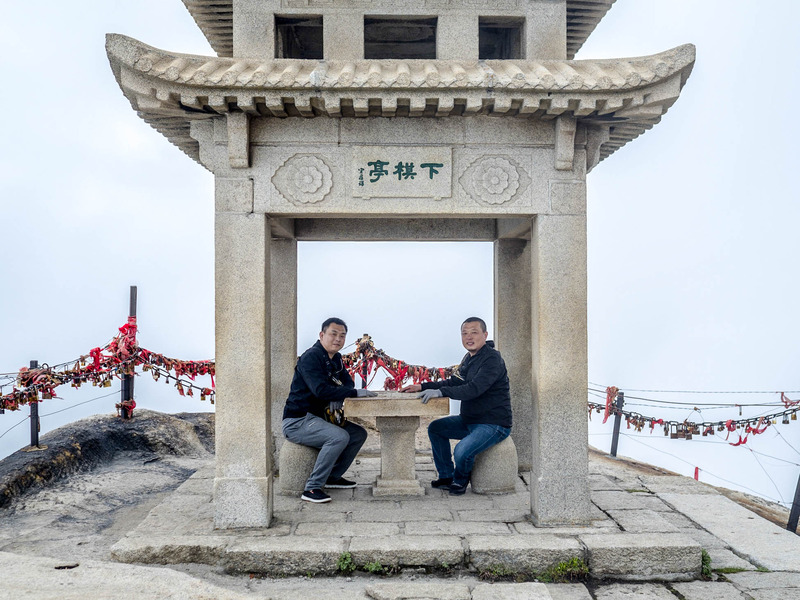 At East Peak, I met two tech developers from Beijing who had come to Mount Hua for the day. After one asked to take a photo with me, they explained that they had started hiking in the morning and reached East Peak at the same time I did. It was 5:30 p.m. and I was freaking out. If I missed the last cable car, I would have to stay at the hostel at the top of the mountain for the night. There was no chance I was going to make it to the Plank Walk and then back to the cable car in time. The developers told me that I should go with them to Yaozi Fanshen or Somersault Cliff, Mount Hua’s second “most dangerous hike.” It was only about 15 minutes away. 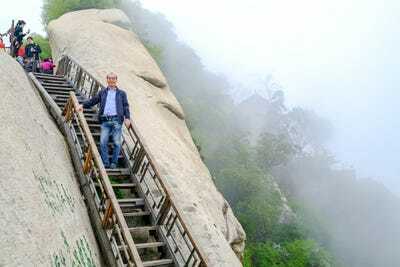 While you don’t walk across a thin plank bolted into a mountainside, Laozi Fanshen is no less scary. You have to put on a harness so that you can climb down a cliff face with nothing more than a steel cables and carved stones to hold onto. The instructor explained how the harness works. Basically you hold two carabiners attached to ropes. As you descend, you have to unclip the carabiners one by one and reattach them below each bolt in the mountainside. If you accidentally unclip both carabiners at once, it’s bye-bye. At least when you climb down, there’s ground beneath you. There are steps carved into the wall. 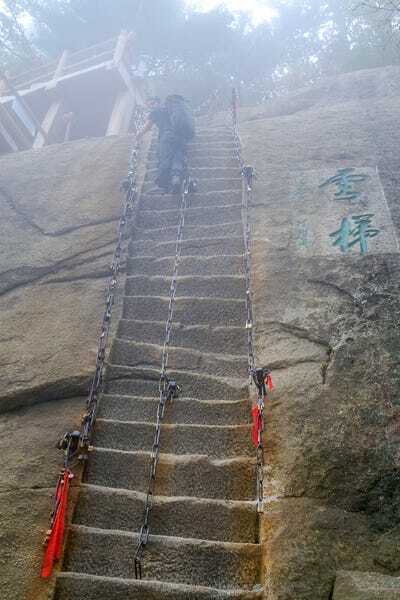 One can imagine hikers in the days before tourist infrastructure using just the steps and not bothering with harnesses and cables. But I was glad I had all that safety equipment. When I looked behind me, there was nothing but clouds. In the distance I could see a lower peak. For a moment, the clouds that had persisted all day began to dissipate and I got glimpse of the landscape below. 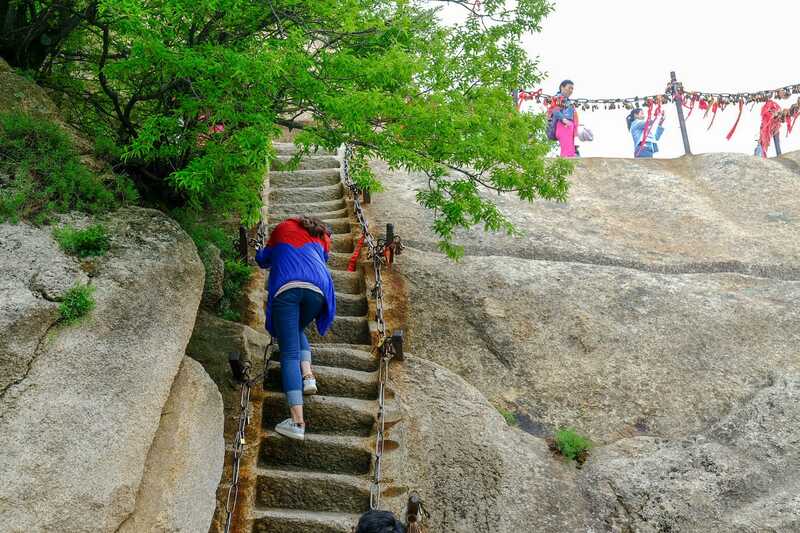 The climb is pretty much straight down. I slipped a couple of times. If I wasn’t attached by the harness, I likely would have fallen about 20 feet. Taking these photos was a risky endeavour. The safety instructor at the top told me not to bring the camera, but, come on. Pics or didn’t happen. 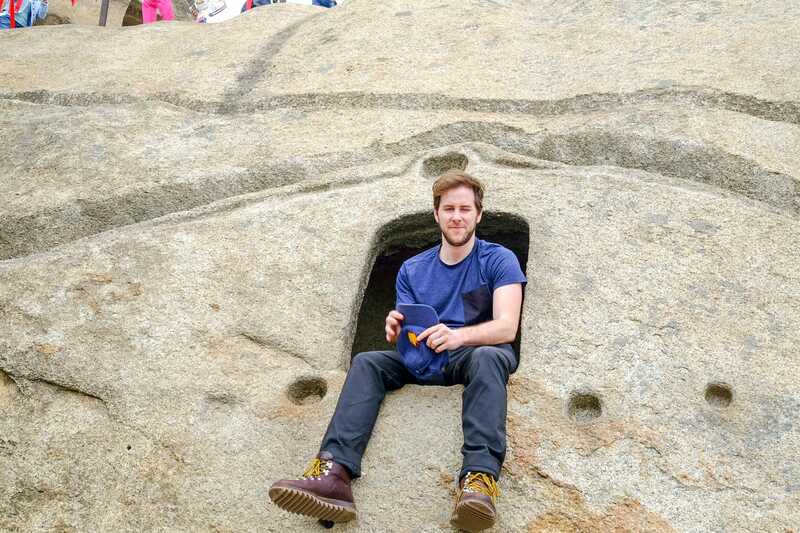 Once you get to the bottom of the cliff face, however, it gets a little less scary. 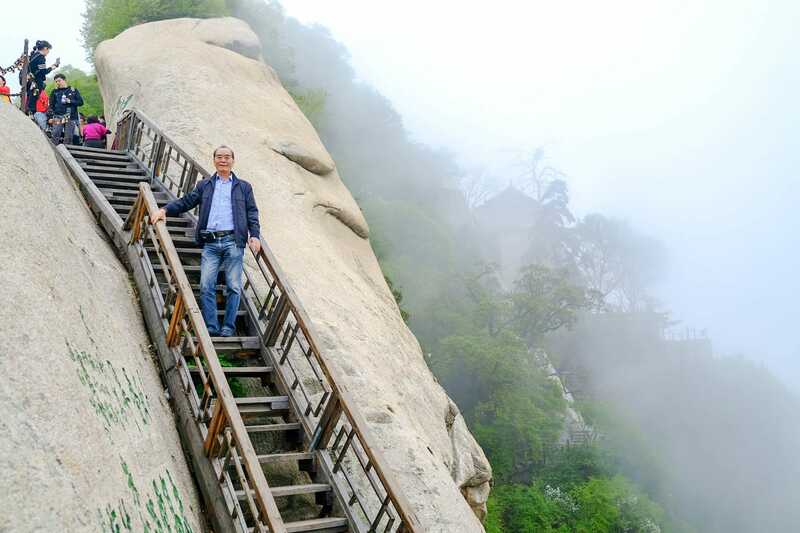 There’s a carved rock staircase that leads you out to Laozi Fanshen. At the end of the path is a pavilion with a chessboard. Chinese people say it is the world’s highest chessboard. 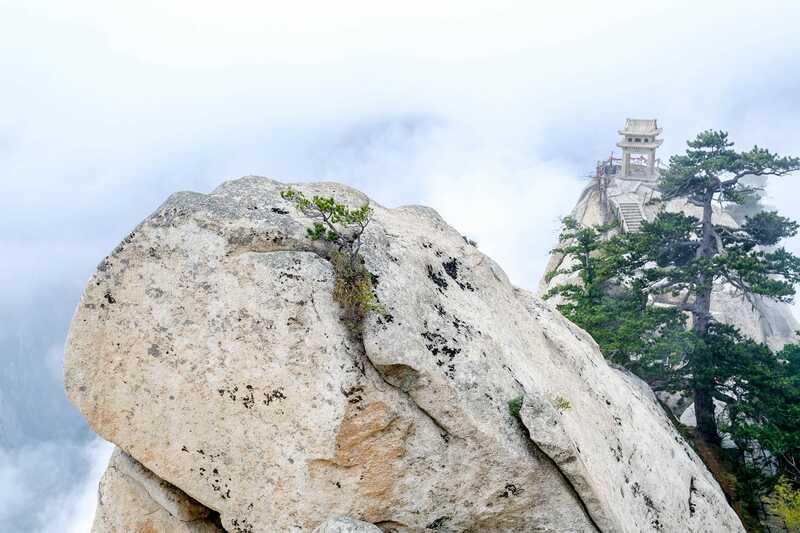 One can imagine a couple of monks duking it out on the chessboard as the sun rises over East Peak. I have a smile on my face, but I was pretty much panicking the whole time. I was convinced that there was no way I was going to make it back in time for the last cable car. After quickly taking in the moment at chess pavilion, I rushed back up the cliff face, leaving my two tech developer friends behind. It was a little stupid to be honest. At a few points, I wasn’t even bothering to clip in my carabiners. Don’t tell my mother. 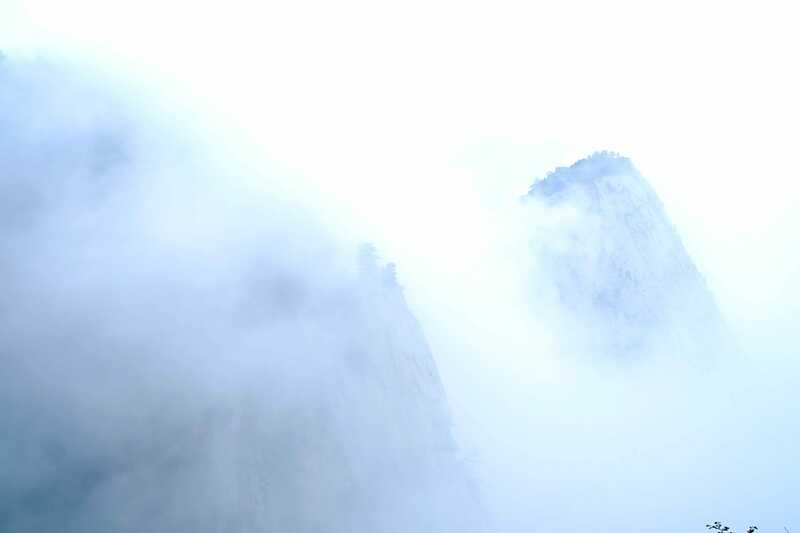 When I reached the base of Central Peak, the fog fully cleared for what it seemed like was the first time all day. It was a stunning sight. But I didn’t have time to enjoy it. I ended up reaching the cable car at 6:45 p.m.. I was maybe the tenth-to-last person to get on line. While waiting, I met two firefighters from Georgia who had travelled to China only to do the “plank walk,” after seeing the videos on Facebook. 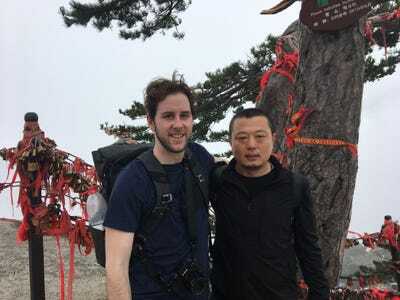 With a background in the military, the two got to North Peak at 3 p.m., sprinted the hike to the “plank walk,” and made it to the cable car at the same time as me. It was good thing I didn’t try to push my luck going to the “plank walk.” I never would have made it. Next time, I’ll be up at sunrise.